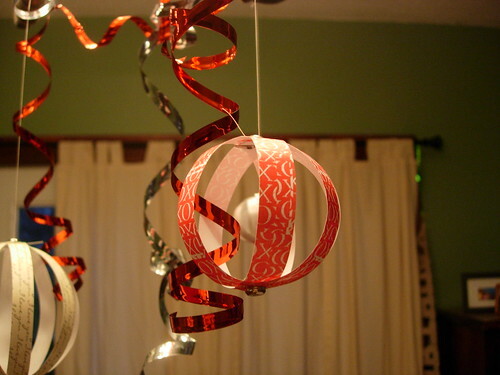 Project #1 completed: those little ball ornaments from Martha's Holiday Issue. I've been dying to make them for months, and I finally got around to it. In time for Valentine's Day. 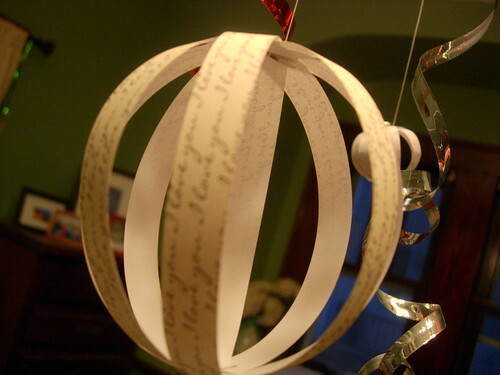 Sorry for the bad pictures, but it's hard to focus on little bits of paper dangling from a chandelier. A second view of the largest ball. For this one, I took "i love you" scrapbook paper, cut thin strips, then cut those in half. So each strip is a little under six inches long. I used an 1/8th inch hole punch and craft brads from JoAnn's. I liked using the 12x12 sheets of paper as opposed to a piece from a Mat Stack because you only have to cut the long skinny strips once, then cut them in half. This is for the 50 Projects LiveJournal group. The goal is to do 50 craft projects in 2007. I'm just joining, so I'm a few weeks behind. January's theme is to finish unfinished projects. I've been searching for the right paper, brads, and hole punch for several weeks on these. My next unfinished project is my Grandmother's scarf, which should have been done 4 weeks ago for Christmas!!! -dying said yarn with Kool-Aid, etc.